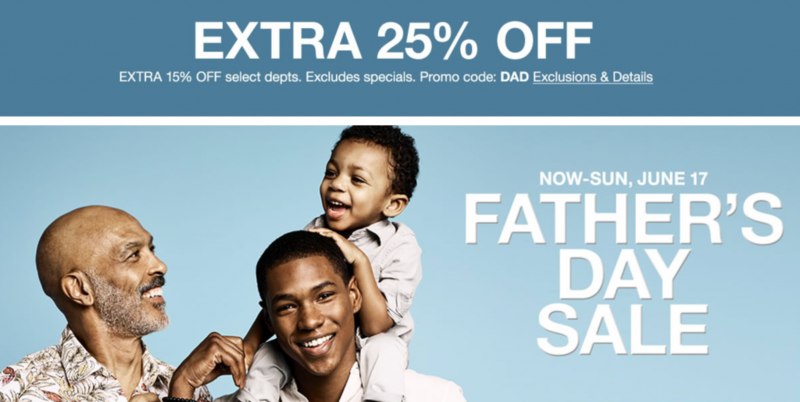 The Father’s Day One Day Sale may have come and gone, but don’t let that worry you because it seems Macy’s is offering a Father’s Day Sale (for the first time I can remember) where you can use the code DAD and get an extra 25% off your purchase! Don’t be fooled – the savings aren’t only for dad. While you’ll find great prices on his favorite watches, wallets and more, you can also find deals throughout the store (just make sure you buy something for dad if you’re buying something for yourself too). Perhaps the best deal of all is the Father’s Day Bonus Buy: get a esquire men’s stainless steal bracelet bonus buy for just $24.99 with any fine jewelry, watch, or men’s purchase. At a $175 value, you’re saving 75% off this stainless steal bracelet! Best of all, you can take advantage of this bonus buy either in-store or online. When in-store, you’ll be given the option to buy at the register. If shopping online, simply add it to your bag and it will appear at checkout if you have the right qualifying items in your cart. If you’re worried about shopping at the last minute and want to score even more savings, shop online for your Father’s Day Gift and opt to pick-up in store (don’t worry, dad will never know…and if he did find out, he’d be proud of you for being such a smart shopper! ).